Email marketing plays an important role in a brand’s growth. A majority of people still prefer emails for commercial communication, and 81% of US online shoppers are more likely to make additional purchases due to receiving emails. In this post, we go over 3 email marketing tips for your Shopify store that you can quickly implement and start connecting with your customers. We’ll take a look at how you can get email subscribers, automate emails, and create some simple campaigns. One of the first things you can do to get your email marketing going is get email subscribers. This will allow you to build a list of existing and potential customers that you can market your products. 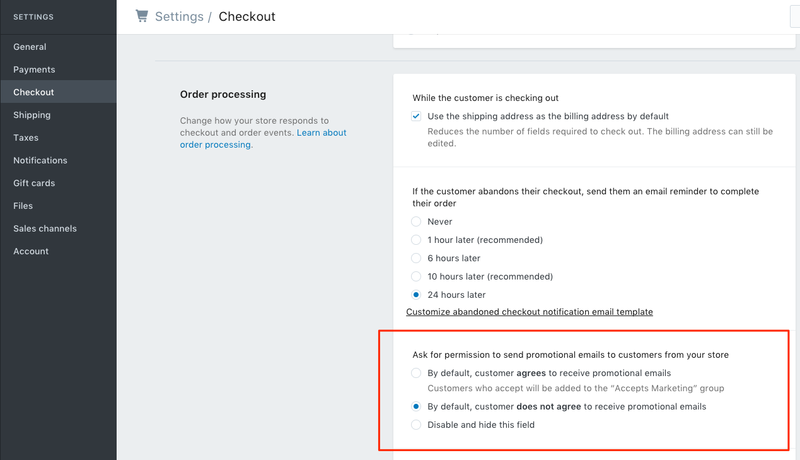 Under Settings > Checkout > Order processing, make sure that the promotional emails area is enabled so that customers can opt in/out of receiving promotional emails from your store for marketing purposes. If you select opt in as default where customers have to opt out of receiving emails, you’re likely to get more subscribers. However, anti-spam regulations in some countries may need you to select opted out as default, where customers have to opt in to receive emails. 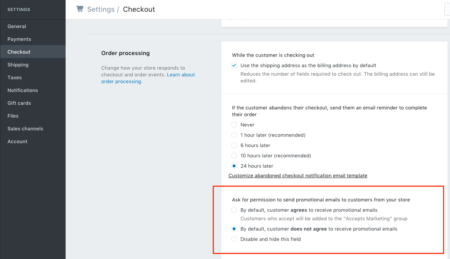 You can also set up an email subscription form prior to customers getting to checkout using a third-party email form for a service like MailChimp. You can use your email list to send mass emails, but that can be hard to manage and track. Instead, connect a free email management platform like MailChimp to your Shopify store. Email management platforms can help automate certain campaigns, and create targeted lists so you have higher conversions. Emails can be automatically sent through MailChimp based on events like new customer for your store, birthday month discounts, etc. In addition, services like MailChimp allow you to track opens and clicks, and perform A/B tests to see what type of content resonates best with your customers. You can use this to further improve the copy on your store and in your marketing emails. One of the first things you can automate is a simple personalized thank you email or order follow up. Instead of just seeing their order confirmation and the thank you page, this email can help build a more personalized connection. You can humanize your brand further by adding an individual’s signature to the email. In the thank you email, or in an order follow up email, ask the customer what their experience was like or any other feedback that you’re looking to improve your store with. Another easy campaign for your subscribers is to let them know about sales and promotions on your store. This feeds into the value proposition to be on your email list as customers get notified about discounts without checking your store often. Lastly, let customers know about any new products you launch. Existing customers already trust your store as they’ve made a purchase in the past. If they’ve had a good experience with your products, they are much more likely to purchase new products, giving you higher conversions. Emails are some of the best ways to connect with and engage customers. Customers prefer email for commercial communication and base many purchasing decisions based on emails. Even if you don’t have any campaigns planned yet, start collecting customer emails with the option to email them for marketing purposes. Once you connect an email management platform, you can automate some of the campaigns so that conversions from emails aren’t a huge burden on your business. You can learn more about some ongoing campaigns in this post about lifecycle emails. What are some quick email campaigns you can set up? Share your experiences in the comments below. I’d have to agree that email marketing is a must for every Shopify site out there. I heard a stat once that mentioned email marketing averages an ROI of $38 for every $1 spent. And with apps/businesses like Mailchimp, there really is no reason not to. I wonder, what are your thoughts on browser push notifications though? It’s a relatively new marketing channel out there and it’s proving to be more powerful than email in many ways. There’s also a few apps out there (like https://aimtell.io/browser-push-notifications) which are making it just as easy to integrate. And with click through rates higher than email – I wonder if it will over time surpass email. Or maybe just complement it? Anyways, keep up the solid articles! Great article. Thanks for sharing the informaton.